Yes. Plastic and copper pipes are prone to calcification, too. The smoother a surface is the longer it can resist the process of calcification. It may take longer until plastic or copper get a first layer of scale. However, once that first layer has built up, the scaling process proceeds just as fast as on any other surface or material. Can Calmat be used with a Water Softener? Yes! 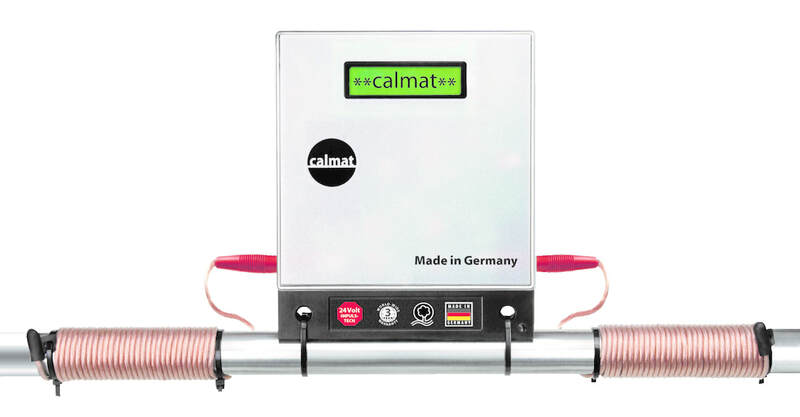 Calmat can be used by itself or in combination the water softener, you can use it either way; if you want your water to be softer, you can keep using both the water softener and Calmat, or if your goal is to simply remove the lime scale from the pipes and appliances, you can use just Calmat. Also We recommend to place Calmat before the water softener so the softener is treated as well. Does the winding direction matter? The winding direction (either clockwise or counter clockwise) doesn’t matter, each impulse cable can be wrapped either way. Does the number of winding matter? The number of winding around the pipe does not have to be necessarily equal to each other and the unit will perform well regardless. Winding the cables a few inches away from the Calmat device is ok as it wont affect the transmission of the electrical impulses. Ideally we recommend winding the impulse cables as tight and neat together as possible for maximum performance. Calmat is continuously removing new and existing limescale. When mono-crystals are created by the impulse variation, it is important that they grow as long as possible before they start their way through the piping system. The larger the crystals, the longer it takes until the crystals fall apart again and eventually "die". In warm water, these crystals grow faster and therefore are stronger and live longer. This explains why the calmat-effect lasts the longest in warm water (up to seven days) and shorter in cold water (approx. two days). Does calmat help with green colored water problem? ​Does the placement of the unit matter? No, the placement doesn’t matter. Calmat can be installed even upside down and is going to work well. It will treat the water from the point you install the unit on wards and will protect the rest of the piping system. I heard of similar products and that they don't work. Can you explain? Please feel free to contact us if you have any additional questions on Calmat. We will get to you as soon as we can.